This spirited 71 year-old’s inspirational books, poems and songs embody a wealth of adventures with challenge, change, comedy. As a young woman Barbara hitchhiked across continents, hostessed a restaurant in Afghanistan, and in 1967, at 22, immigrated solo, from the USA to Australia. Down Under All Over, written with “a lover’s indulgence and passion”, contrasts 1960’s with 1990’s Oz and has attracted salvos from such Aussie icons as John Williamson, Eric Bogle and Barbara’s gas-fitter. Barbara’s most challenging adventure, however, began in 1984 when she was diagnosed with multiple sclerosis. Her courage and commitment to explore and risk personal and spiritual change is chronicled in Journey to Wholeness—-acclaimed by icons like Deepak Chopra and hailed by one reviewer as: “Probably the most honest book ever written”. Barbara’s recovery and her conviction that we have choice, regardless of the issue, has inspired many. Barbara’s Rambunctious Writing and other spontaneity workshops and retreats emerged from her decision to stop being a serious cookie! Seeking to crack the shell on her silliness Barbara entered comedy classes and was, with her classmates, gobsmacked at their creativity and wittiness. Where did it come from? By using simple structures to give the left brain a holiday and practicing the comedy principles–saying YES to, instead of blocking, the offer of the moment–unexpected, unplanned, unknown, extraordinary, imaginative, words and ideas burst forth. Barbara’s writing, teaching and life changed. 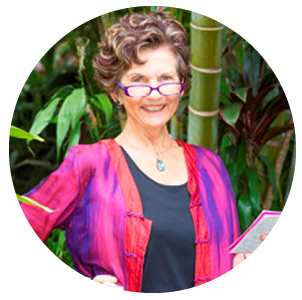 For over 20 years her passion has been helping others practice “The Power of Now” through Rambunctious Writing and other avenues–while laughing a lot!